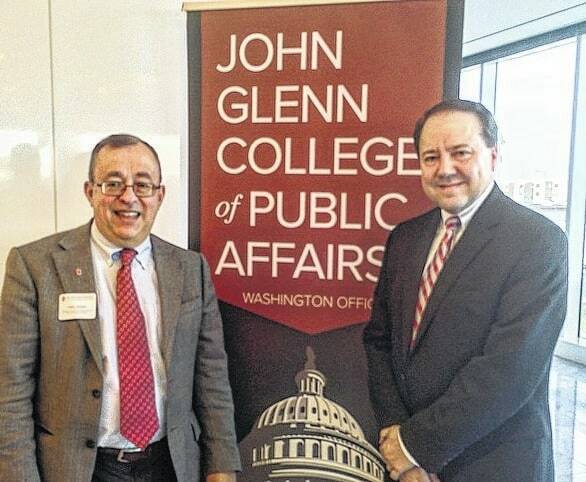 Congressman Pat Tiberi, R-Genoa Township, on Tuesday accepted the “Excellence in Public Service Award” from the John Glenn College of Public Affairs at The Ohio State University for his service to the people of central Ohio. Tiberi (right) is pictured above with Herb Asher, OSU professor emeritus. “As an alumnus of The Ohio State University, I am especially honored to receive this award,” said Tiberi. “Throughout my time in public service as a congressional staffer, Statehouse member, and now in Congress, serving constituents has been my priority. I am especially grateful that my former professor, Dr. Herb Asher, presented me with this award. He inspired me all those years ago. It was my internship through his class that opened my eyes to the good that government can do and the positive impact it can have.” The award pays tribute to an individual with an outstanding tradition of service in the public interest.